The Napoleon Ascent 33 Electric Fireplaces imitates the look of a traditional masonry fireplace but with all the convenience of simply plugging it in, sitting back and enjoying the heat and glowing log set! Napoleon's flame technology randomly adjusts the flame effect, colour, height & speed creating the illusion of a true wood burning fire with a modulating ember bed for the realistic glow of burning wood. The ULTRA BRIGHT LED lights and convenient remote control enhance the allure of the Ascent 33-inch Electric Fireplace. Perfect for any room in a house, condo, apartment or office. Can be plugged in 120V or hardwired 120V/240V, producing 4,500 BTUs and 9,000 BTUs respectively and warms up to 800 sq. ft. The Napoleon Cinema Glass 24 Built-In Electric Fireplace sets a rich and inviting tone for any room in the house. A scintillating topaz glass ember bed dazzles all with the flickering flames, or create a subtle sparkle with the unique NIGHT LIGHT setting. This modern electric fireplace is ready to use out of the box; just order it with the Whitney Mantel Package and plug it in. Fully customize this electric fireplace by installing it into a wall. With the push of a button it's easy to adjust flame brightness and heat intensity from the 5,000 BTUs of power that doesn't require chimneys or venting. Perfect for any room in the home. The Napoleon Woodland 18-inch Electric Log Set is the perfect solution to filling in an old pre-existing masonry fireplace opening. Create the coziness and ambiance of a real fire without any of the mess. This hand painted Electric Log Set is as easy as plug and play for an instant update to your room. The Woodland 18 comes with an included remote allowing you master control over flame height, intensity, heat and even the ember bed lighting. 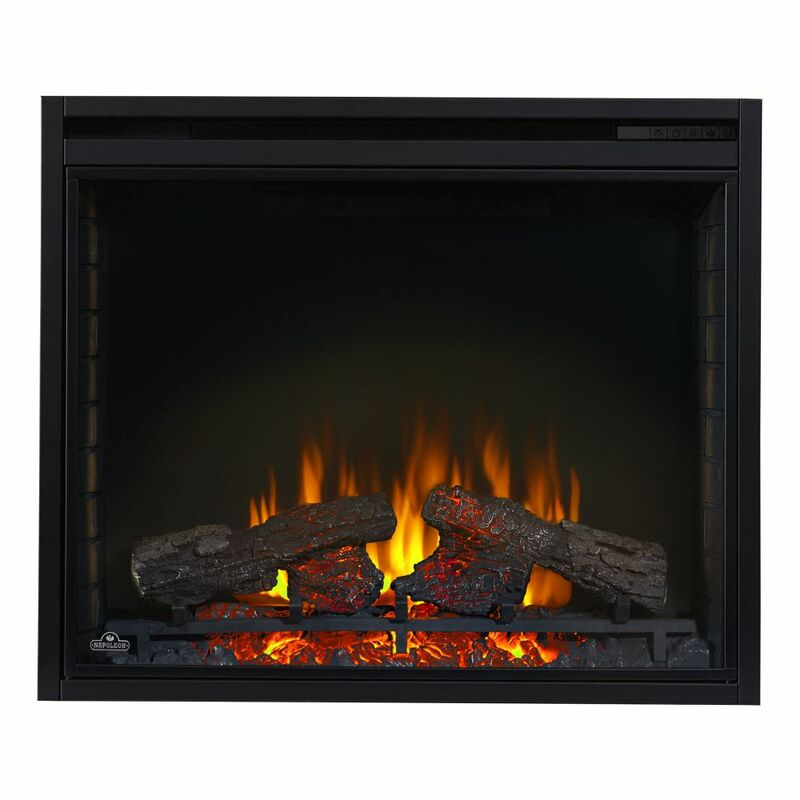 Ascent 33-inch Built-In Electric Firebox The Napoleon Ascent 33 Electric Fireplaces imitates the look of a traditional masonry fireplace but with all the convenience of simply plugging it in, sitting back and enjoying the heat and glowing log set! Napoleon's flame technology randomly adjusts the flame effect, colour, height & speed creating the illusion of a true wood burning fire with a modulating ember bed for the realistic glow of burning wood. The ULTRA BRIGHT LED lights and convenient remote control enhance the allure of the Ascent 33-inch Electric Fireplace. Perfect for any room in a house, condo, apartment or office. Ascent 33-inch Built-In Electric Firebox is rated 3.0 out of 5 by 3. Rated 2 out of 5 by Jim from The visual display is very nice but the heater function is not very practical. First the flames m... The visual display is very nice but the heater function is not very practical. First the flames must be on to get heat. I'd like to use it all night and don't want the flames going all night. Second the thermostat function does not work very well. The heat discharges at the bottom of the unit and then flows over the unit. This means the thermostat get's heated up and leads to erratic heating that doesn't really keep a consistent set point. Because the power on/off is electronic there is no way to use an external thermostat. I ended up returning the unit. Rated 5 out of 5 by sis2467 from IT IS BEAUTIFUL Easy to assemble and absolutely beautiful in my large county kitchen. You can adjust the type of flames, lighting and it heats the area where we have our coffee and read. Guests and family members already want to purchase this item. It looks great mounted on the wall.